Giffords' Reaction To Shuttle Launch: 'Good Stuff' : The Two-Way Aides say those were the first words from Rep. Gabrielle Giffords (D-AZ) after she watched this morning as her husband, Commander Mark Kelly, and five other astronauts successfully launched into space aboard the shuttle Endeavour. Aides say those were the first words from Rep. Gabrielle Giffords (D-AZ) after she watched this morning as her husband, Commander Mark Kelly, and five other astronauts successfully launched into space aboard the shuttle Endeavour. Her staff is briefing reporters now at the Kennedy Space Center in Florida. Giffords is recovering from the severe head wound she suffered on Jan. 8 when a gunman attacked an event she was holding in Tucson. Six people were killed and another 13, including Giffords, were wounded. She will return later today to the Houston rehabilitation center where she is being treated. 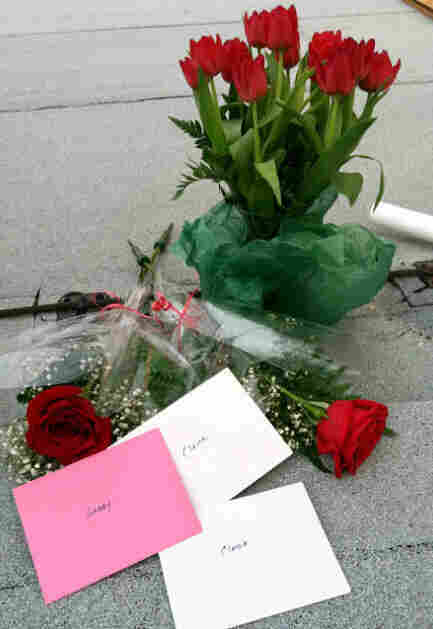 Giffords' staff also released a photo of the flowers and cards that Kelly left behind as gifts for his wife and his two daughters.